KATHMANDU, Oct 30 : Shrimadbhagawat Mahapuran has been organised at Budhanilkanta with an objective of promoting a fair at Budhanilkantha Narayansthan from Kartik Shukla Ekadashi to Poornima. A special fair is organised here for five days from Haribodhani Ekadashi. Inaugurating the Mahapuran, Minister for Women, Children and Social Welfare, Bikram Bahadur Thapa, said that initiative would be taken to include Budhanilkanta area in the list of world's heritage sites. Minister Thapa said, 'Many people have still wanted a Hindu nation. They have not revealed this due to various reasons. Such sentiments had come out before collecting suggestion for constitution." Similarly, Mayor of Budhanilkantha Municipality, Uddhav Prasad Kharel, Chairman of Main Organising Committee and Budhanilkantha Area Development Committee Chair, Jayram Thapa, Chairman of Budhanilkantha Temple Management Committee, Sakul Shah and Chairman of Budhanilkantha Sanatan Dharma Sewa Samaj, Bikas Tamang, among others stressed that the government should take initiative to enlist the area in the world heritage list. The Mahapuran will run till November 4. 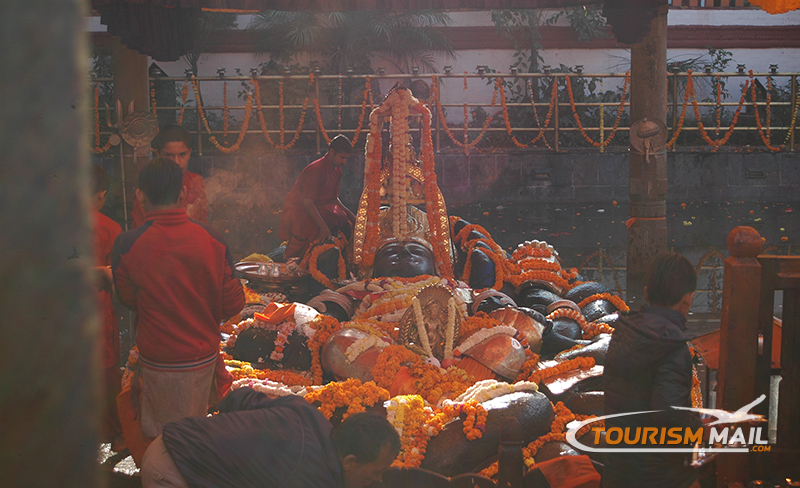 The amount collected in Mahapuran would be spent for the renovation of the Budhanilkantha Temple.